I know him as the man who reinvented the vacuum cleaner as a boy’s toy with his geeky engineering wizardry. How was it that this boring domestic appliance could become cool? It took some seriously special alchemy. Men would become interested in vacuuming, apparently. Well, I bought one. 10 years later it still works… but we need to go back a bit further first. It must have been in the early 1990s when I first saw him on Tomorrow’s World, a TV program in the UK explaining his new root cyclone technology to the hostess, Judith Hann. He’d got through over 5,000 prototypes and had quite a large overdraft at the bank, to the tune of 2 million pounds if I remember rightly. Dyson was even telling tales of giving the bank manager demonstrations of his vacuum to convince him of its worth. 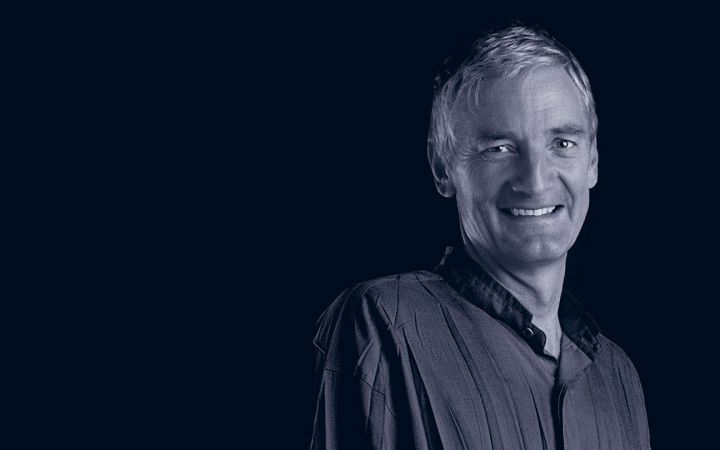 Well, the bank manager clearly made the right call – Dyson’s vacuums became hugely popular in the UK and deservedly made him a multi-billionaire. Today he continues to show a tireless appetite for improving the things we take for granted. 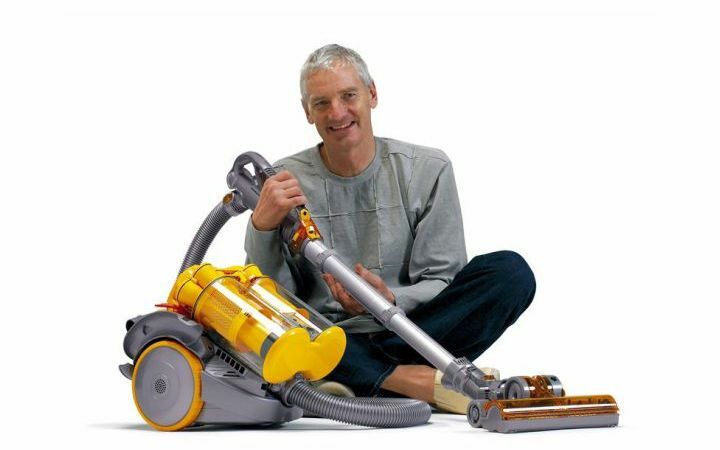 James Dyson and one of his many vacuums. 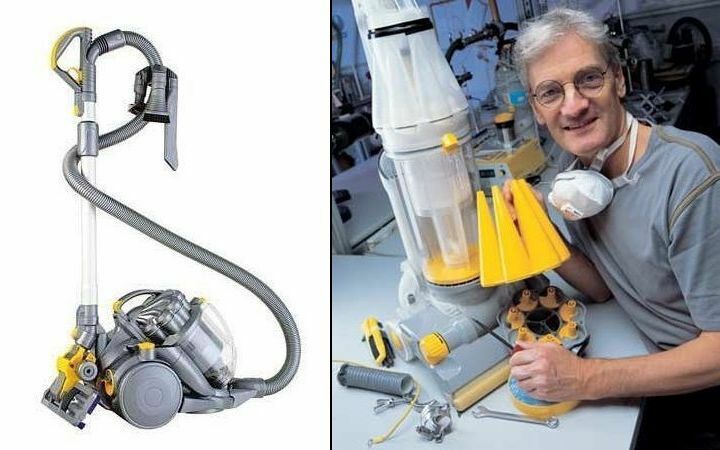 On the TV show, Dyson explained how the cleaner worked it was the first time a vacuum cleaner had broken into full-blown geek territory with just how cunning this thing was. It might as well have been plucked out of Harry Potter. When the Dyson actually became available in the UK, a lot more men apparently became interested in doing the vacuum cleaning. I have this theory that any domestic appliance, once made mystical enough, becomes “man territory”. I suppose the sight of a male engineer on TV geeking out over the technical details like so many men do over cars rubs off after a while and somehow James Dyson had accomplished the miracle of making vacuum cleaning cool. I can’t even believe I just wrote that. Anyway, let’s let Dyson himself talk about his inventions for a few minutes. Hilariously the presenter keeps calling James John by mistake but you get the idea. 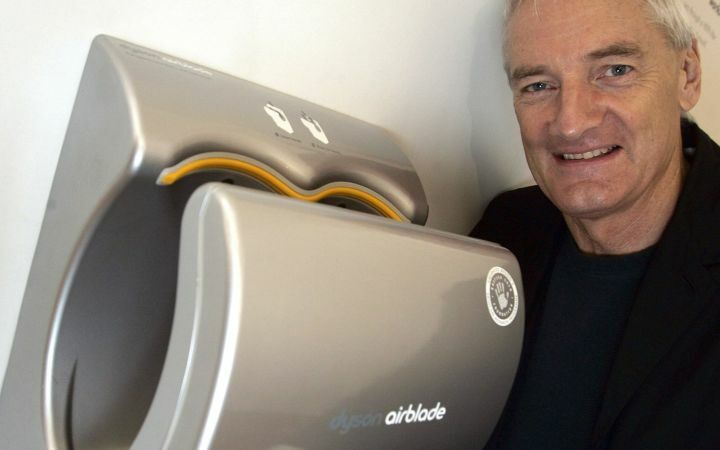 James Dyson likes to improve things. Everyone gets familiar with the people who shape our world and create the everyday things we use. Everyone will form their own list of inventor celebrities as they grow up. I guess most people have heard of Steve Jobs and Bill Gates at least, maybe even the likes of Nikola Tesla or Thomas Edison. Of course I’m not even scratching the surface because there are so many! Now, your personal list is going to depend on how old you are, biases you picked up and the life experiences you had, and you’re welcome to name your favourites in the comment section at the end. Please do. 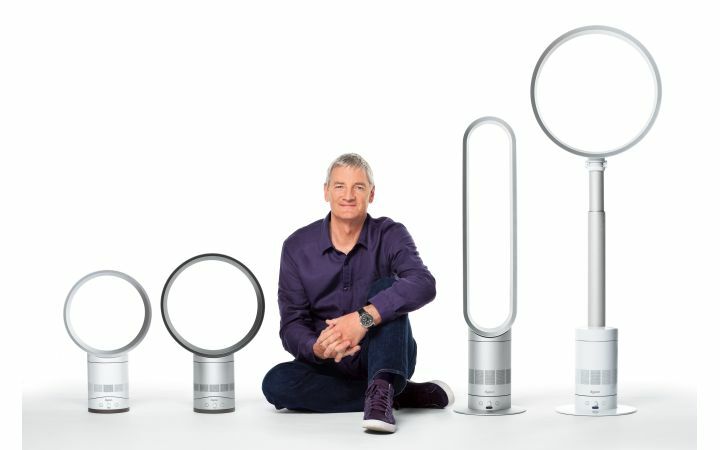 Dyson Air Multipliers, bladeless fan technology in assorted shapes and sizes. In this new series I’m going to introduce some of my favourite inventors and the life changing products they are responsible for. It’s going to be a bit random because I want them to be interesting, so I’m going to skip some of the most familiar ones. There’s no point in talking about the products of Steve Jobs when everyone already knows about Apple, that seems redundant. In particular I’m keen to introduce you to something that might be overlooked or less familiar. When I was old enough to need a vacuum cleaner for myself my personal bugbear became the dust being blown around, which didn’t do my health any good. Thankfully all of that has been a distant memory for quite some time, because doesn’t everyone use a Dyson? And if it’s not the Dyson itself, it’s probably a reasonable copy. In the UK we said “goodbye to the bag” and embraced cyclones and plastic jugs. The Dyson-style vacuum cleaners are bagless. They cleverly spin the dirt out using cyclone technology and the debris collects in a jug, even the very fine powdery dust that would normally blow straight through one of those bag types. On 2nd July 2006 I bought a Dyson DC08 cylinder vacuum cleaner for myself through Amazon, which itself seemed like science fiction. Wouldn’t somebody normally go to a hardware store? Well, maybe. But I didn’t have a car, didn’t feel like carrying a vacuum cleaner all the way home, would get home delivery by default. Let’s face it, internet shopping is way convenient. A few days later there it was. This all seems normal now but then it was honestly still a novelty. The DC08 and James Dyson working on yet another vacuum. The funny thing about where I was staying at the time is that every time I vacuumed I’d be asked if I was leaving. It seems like previous lodgers would only clean their room when about to move out! Well, we had a giggle. I’m just the type who cleans when the dirt is noticeable and doesn’t fret about it otherwise. I don’t really have a routine. Is that normal? It seems sensible enough. If I had to replace my DC08 today the Dyson DC19 looks similar, but I would choose the more advanced Dyson DC28C Musclehead based on function and value for money. In the 10 years I’ve owned my DC08, a lot of extra innovation has gone into the DC28C. I’m impressed! You can see the rest of the Amazon UK range here, but I think I’ve picked the best compact. Where I live currently the motorway service stations often have Dyson Airblade hand dryers. Everyone has no doubt encountered those weak dryers that are so slow to get things done. The airblades focus air into a fast sheet that literally blasts the moisture off! Quite remarkable. I mean you’re done in 10 seconds or less and I don’t think the air is even heated, it’s pure velocity that does the drying. Bladeless fans are also a thing now. One of the most adorable things I’ve seen on YouTube was a Japanese toddler playing with one, but the video I remember the most was a balloon going through an assault course of fans made by apparently bored and mischievous Dyson engineers. I’ll leave you with this last video, showing what Dyson engineers get up to after work using the bladeless fans they invented. One balloon and a couple of evenings after work – Dyson engineers show how inducement and entrainment works on the Dyson Air Multiplier fan. If you watch closely, the balloon is sucked into the airflow from behind and to the side of the fan; this is inducement and entrainment of the air. There’s so much good Dyson tech that I’ll have to find some good sources for you for if you want to buy outside of the UK. Expect an update in the future! I hope you found that entertaining and informative. Don’t forget to leave a comment, follow and share this with your friends and family. This man is a genius. Until I was gifted a robot that vacuums for me, I used the Dyson model exclusively. He reminds me of Ben Franklin in that he just keeps inventing and inventing. It’s fitting that the man who invented anti-counterfeit technology appears on the very bills people try to fake. Now waiting on a price drop for the Dyson machine that cleans hardwood floors. Have you used it? Using a mop is a literal drag – dragging dirty water all over the house. Oh, lovely! Thank you, Cirian. 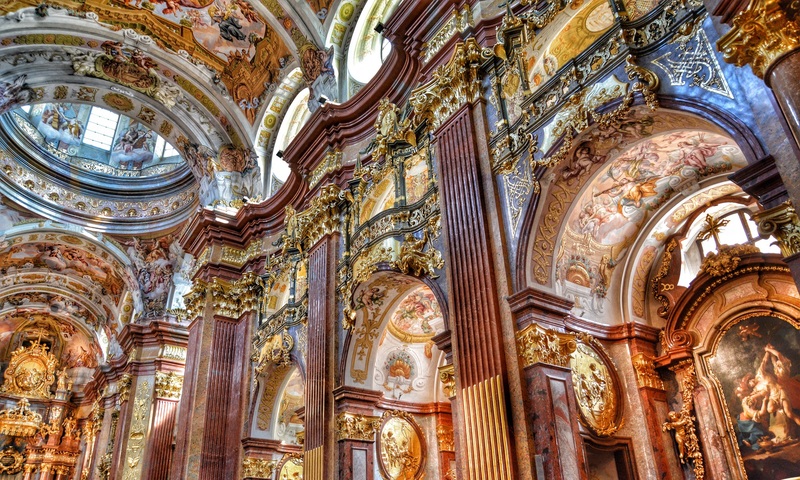 The inventors and Makers of our world do need to be honored more, I am thinking. After all, they are helping to create this world we live in. The creativity that goes into developing new products is astonishing and I am glad you are choosing to highlight the contributions these Makers have made to our world. Thanks Netta, you’re welcome. Inventors have been such a big inspiration to me, I can’t wait to finish the write-up of my next one.